Taking Pride in our Community—A plea to keep it trash-free and nicely landscaped. San Miguel Chamber of Commerce has made great progress improving the garden areas along Mission St.
Last fall they applied for and procured a county grant of $1300 to pay for expenses involved in making improvements to those gardens. At about the same time, they received a donation from San Miguel Garbage Company of some compost for garden plots between 13th and 14th Streets that was spread on top of ground to allow soaking in and later be mixed into the existing dirt. If you are not aware, the soil in the existing garden beds was poorly prepared when first installed by county contractors, including inadequate watering system and has been an ongoing struggle to keep them looking nice. Since the county was only taking responsibility for installation, maintenance didn’t happen for some time. Thankfully the San Miguel Chamber of Commerce agreed to take on this project. also donated the two picnic benches at 14th St as well as the two new trees. He also has volunteered to be responsible for maintaining the 14th St. large garden area with the picnic tables. Wow! Thank you Mr. Gavino and son as well as Mike and Miki. Mike Sanders, who spearheaded this for the Chamber, would love to have more people step up to the plate and offer to take responsibility for maintaining a garden area. The plan is to apply for more grant money this year and complete more garden sections. The blocks between 11th - 13th should be easier because they won’t need quite as much work. The goal is to have beautiful landscaping along Mission St. to enhance the town, especially the downtown. Everyone can help by just putting trash in the provided trash receptacles rather that throwing it on the ground. The hope is that people will take pride in the downtown and do their part to keep it looking nice. The San Miguel Parade Committee and the SMCC would like to thank the following organizations for their sponsorship of the San Miguel Sagebrush Days Parade and Peddlers Faire: San Marcos Creek Vineyard and the San Miguel Garbage Company. We would also like to thank those who donated to the event and who paid for advertising and for their booths prior to and during the event. Thanks so much from all of us!! Best Over All: The Vaqueros de San Miguel for their beautiful horsemanship, the impressive numbers of riders and in memory of the passing last year of one of their great riders and mentors. We honor their presentation. Best Float: The Elkhorn "Fillies", a venue that has only been reinstated this year after several years of retirement. Thank you, ladies, for your historical participation. Best Group Vehicles: The Estrella Warbirds, always a welcomed presentation of their WWII era vehicles and of the history (particularly of San Miguel) which they represent. 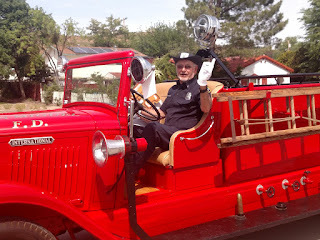 Best Individual Vehicles: The San Miguel Firefighters 1937 Fire Truck, a nostalgic view of our community services (the driver, Gib Buckman, also received the "Key to the Town" during this exhibition!). The Best Mounted Group: The San Luis Obispo County Sheriffs' Posse, a stellar team of equestrians and a reminder of the law of the Old West. The Best Individual Walking: The San Miguel Advisory, with thanks to John for representing the Council and reminding us of their involvement in helping bring about improvements for the community. Also noted: The Advisory Council will be having an election for Council members in June. Nomination applications can be collected at the next Advisory Council meetings scheduled for April 26 and May 24 at 7 pm at the San Miguel Community Center (between K and L Streets in the alley by the Library). Your participation makes a difference in San Miguel. This year's San Miguel Parade Committee Special Award goes to The Native Sons and Daughters of the Golden West for their large walking group's display of the massive California Flag. A thrilling sight! Thanks for being a part of Sagebrush Days and congratulations to everyone! Thanks to the Ranchita Canyon 4-H Club,The Mission Street Benches Got Much Needed Attention. Sunday, March 19th to help sand and oil the benches on Mission Street in San Miguel. The San Miguel Chamber of Commerce thankfully recognizes Kaitlyn Hebrard, Reagan Glenn, Briley Bowen, Bella Bowen and Bennett Cavalletto and their parents who showed up at The San Miguel Mercantile bright and early in the morning to take care of this very needed assignment. The SMCC hosted a great Mixer at the Military Museum at Camp Roberts on March 7th. and wine (generously supplied by San Marcos Creek Winery). This was a very dynamic and informative mixer. Look forward to our next Mixer in June at the Vines RV Resort and in July with the 4North County Chamber Mixer in Templeton. More information about dates and times of mixers and the May Car Show will be announced as we draw closer to the actual event. If you'd like to see our downtown area looking good, find a way to get involved in helping with this project.. Downtown Landscaping needs your help. Some background: For several years now, the Chamber has tried to get businesses and community members to adopt sections of the downtown landscape to keep it looking nice with weeds under control. Some businesses and a few individuals stepped forward and adopted a section, but not all were adopted. Unfortunately, we've had some businesses move on and some adoptions given up. Fortunately we have had some quarterly help this year from employees of Courtside Cellars--that has been greatly appreciated. We are thankful for "the Walky-Talkies", San Miguel Mercantile, and Linda's Country Diner for consistently caring for their adoptions. We also appreciate those who have helped in our bimonthly landscape workdays. We also appreciate San Miguel Garbage for always supplying containers and disposing of the green waste as well as the liter we collect. Unfortunately, lately we have not had enough help to sufficiently tend to all of the needs of the un adopted spaces. We have also faced some problems with the deficient water system put in by the county and many of the plants have died as a result. This is an ongoing problem that we are hoping will be resolved in the near future. amount to contribute to the project or Adopt a Bench by donating at least $200 to the FUND. If you adopt a bench, it can be done as a memorial to someone , a family or business. There is still time to get involved and do what you can to improve the community. Take a walk down Mission Street and check out and enjoy all the memorial benches. The San Miguel Chamber of Commerce would like to invite you to consider joining their organization. They are a fully structured Chamber of Commerce with a Board that meets the first Wednesday of the first full week of the month. Their next meeting is scheduled for February 5th. They always meet at Mars Mega Storage at 100 Wellsona Road at 6:30 pm. Members are welcome. They have great news! All current member businesses and service organizations in the area, including churches, are welcome to free advertisement via their new website. You’ll find them at sanmiguelchamber.org. In fact, if you haven’t done so yet, check to see if your business has already been placed in the Business Directory of the Chamber website. If it is, please inform your customers that you are a San Miguel Chamber of Commerce member by listing their website address on your website. If you peruse their site and discover that your website isn’t already listed there, contact the number below and they will rectify that absence immediately. They want to encourage your having an automatic link between your business or organization and the Chamber because they care about your presence in San Miguel. If you would like more information or would simply like to join the San Miguel Chamber of Commerce, please contact Mike Sanders at (805) 712-9120.
that linkage. The web-site should be operational before winter of2013. raffle will add to the fun. Come join us. portion of funds from last year's treasury in order to do so. for business-friendly support in the North County area. On October 16th the membership of the San Miguel Chamber of Commerce was invited to its First Annual Meeting at RiverStar Vineyards and Winery in San Miguel, California. Great food was served by Dallas, of The 10th Street Café, Basque Restaurant, and by Melissa Saler of N2 Productions, an award-winning area caterer. People partook of the fine vintages of RiverStar and we were grateful to Muriel and Ed Dutton for their generous offer of their winery for this occasion. Vicki Shelby, Frank Mecham’s Assistant, Greg Rambo, San Miguel Advisory Council Chairman and his wife, Mary, Jean and Richard Hoffmann, of The Native Sons and Daughters of the Golden West, Rene Salas, Manager of the CSD, Noel Carpenter, an area realtor, the Templeton Chamber Executive Director, Berdette Robison and a representative from Continental Labor Resources in Paso Robles attended as well as Members of the Health Department, who presented details of the area food survey conducted by Kathleen Karle, the Health Department Director. This study had been completed earlier in the year at the Chamber’s request. All told 26 people attended this historic meeting. Charter members in attendance were issued certificates of recognition. On behalf of the San Miguel Chamber of Commerce Board of Directors, we wish to thank each and every person who attended. We want the community of San Miguel to know that we are grateful for the assistance we initially received from the San Miguel Senior Center in their allowing us use of their facility while we constructed our bylaws. We also want to thank the SMRC for their ongoing support and friendship, for their providing us with a nonprofit status as one of their subcommittees while we were producing our Articles of Incorporation. Our appreciation for the San Miguel Resource Connection cannot be overstated. Without their help we might not exist today. The Chamber has taken on two special community tasks that we’d like residents of San Miguel to know about. First, the SMCC is responsible for coordinating participation in clean-up and maintenance of the sidewalk gardens on Mission Street. We will have a community workday on November 17th from 8 AM to Noon on Mission Street. All members of the community are invited to help with this clean-up project. We’ll provide the donuts! Secondly, the SMCC has hosted two Candidates Forums in San Miguel, one for the CSD and the other for San Miguel School Board candidates. We will likely continue to assume this responsibility for hosting future such forums. It would help greatly if the community attended. Finally, we intend to retain our link with the Discover San Miguel Website even while pursuing our own website, the construction of which will be announced very soon. Once we have our own website, Chamber of Commerce members who are business owners or who represent community organizations can be assured a place for name recognition. Now that we are a genuine Chamber of Commerce regular membership is due. This funding is essential to assure that improvements for business and community development occur in our area. Please contact me at mlandsea@yahoo.com or call (805) 975-6996 for more information. In the late 1880’s needs of the populace of northern San Luis Obispo County dictated that bridges across the Salinas River were needed in order for the local farmers and business people to transport goods and services. In addition, new roads would improve access to the various farming communities. The first two bridges and their access roads were built by and paid for from the pockets of concerned individuals in Templeton and Paso Robles. Soon it became apparent that county coffers were increasing due to the “flow” over bridges and roads. The people demanded that the county pay back the investors and build a bridge in San Miguel. Suggestions to pay for the new construction included use of this new source of funds, new taxes, bonding road districts and encouraging private subscription. Citizens joined together in an effort to enhance the quality of their lives by increasing access to goods and services. This helped advance resources and support for the community in San Miguel as well as the rest of North County. A drive to build a flouring mill here capitalized on the abundance of wheat produced by local wheat farmers who in turn were able to increase their profits by keeping production local. Without a local mill, San Miguel wheat farmers had been forced to ship their wheat to the Bay Area, resulting in little or no profit. Even in those days, profit in farming was based on middle levels of production. The mill proved to be a cooperative innovation that helped tide them over from year to year with consistent success. San Miguel kept growing and developing. Public pressure was brought to bear on the county to build the bridge as a result of the new developments and because the river posed a major obstacle to access from farms and ranches to the town. Since the bridges built with private funds had made a significant difference in the wealth of the overall county, officials finally acquiesced to the pressureand built the bridge. Today, although San Miguel is a much smaller community than it was then, it still makes sense for us as a community to band together to gain improvements by achieving a cooperative support network with our county administration. More recently, the county has adopted a much stronger presence in unincorporated areas such as San Miguel. Clearly, citizen unity and cooperation is influential in helping to maintain support for development as well as to retain a unified sense of our own specific community identity. The people of San Miguel have a history of working together. This is how we will continue to build a growing community —by working together. We begin by developing a goal and then support the project to attain that goal - plan it, finance it, construct and enjoy it. We have sidewalk gardens and a community garden (at Lillian Larsen School) that we can all support right now and the Chamber Development Group has been conducting research to obtain a grocery store for our area. Together, we will achieve our vision for San Miguel!